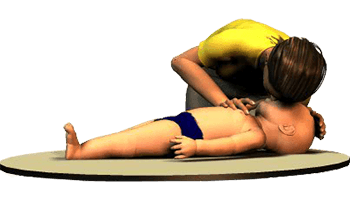 If the victim has a pulse but is not breathing, provide rescue breathing at a rate of 1 breath every 6th second. The breaths should be sufficient to make the chest rise and be delivered over 1 ½ - 2 seconds. Deliver 10 rescue breaths (about 1 minute). Then re-assess the victim starting this time with a pulse check. Be careful not to breathe with too much force or volume. This will cause abdominal distension. The victim’s abdomen will swell and make it difficult to ventilate. 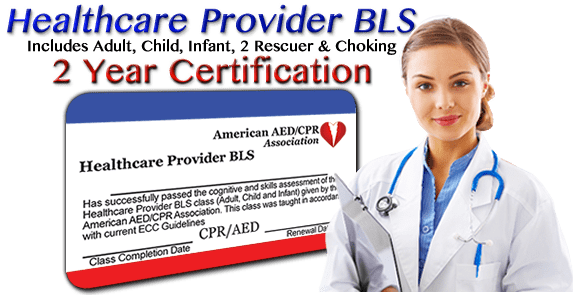 Starting with a pulse check, you should re-assess the victim after every 5 cycles of CPR (about 2 minutes) or after every 10 rescue breaths (about 1 minute of rescue breathing). If victim has no pulse, continue CPR. If victim had a pulse, check breathing. If victim has a pulse but is not breathing, provide 1 minute of rescue breathing (10 breaths) and re-assess. If breathing and circulation are present, re-assess the victim every 1-2 minutes. You may pickup the infant and cradle the victim on his or her side. This will prevent the victim from aspirating any vomit and allow you to easily monitor for breathing and circulation. You may also move the victim.